Categorized as: Asia, Grantee, Job Creation, Our Partners, Poverty Alleviation, Stories & Tagged as: Ecopreneurist, Elrhino, India, Social entrepreneurism, Tamul Plates, Upaya Social Ventures on November 20, 2014. A quiet movement by young social entrepreneurs across north and east India finds ways to turn waste from plants and animals into jobs for the ultra poor. This article originally appeared on Ecopreneurist. Across India, young entrepreneurs are finding ways to innovate the mundane. Using found technology, they cobble simple machinery together to do more than just recycle: They’re expanding local resources and transforming waste products into profits. This spring, I visited a few small businesses achieving a triple bottom line in achieving financial, social, and environmental impact. 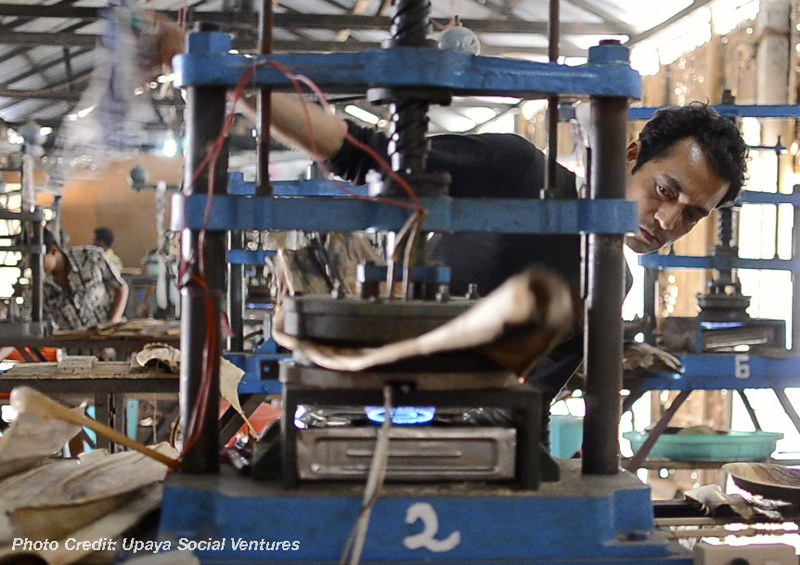 What do they all have in common?—They’re all investees in the portfolio of social-enterprise incubator, Upaya Social Ventures. Tamul Plates: Growing up in the shadow of a steel mill owned by India’s megalith Tata, in Jamshedpur, Jharkand, 33-year-old Arindam Dasgupta turned his family’s legacy of industrial manufacturing completely on its head. Something called him into the country, where he defied his parents’ desire for him to study science and instead pursued a master’s in rural agricultural management from the Institute for Rural Management Anand (IRMA). Launching a company in northeast Assam, Arindam found a use for the giant leaves dropped by arecanut palm trees—dinnerware. Using plant material that used to go into decorative fencing around mud-stucco homes—or just rotted where it fell on the ground—Arindam and technical manager Arup Pathak designed a heated steel-plate press that shapes cleaned and dried palm leaf sheaths into disposable, biodegradable dinnerware, now sold across India for parties and weddings. Hundreds of local families are now employed by the company (called Tamul after the Assamese word for palm nut) to collect the sheaths and leaves. Tamul Plates’s production lines include a factory that employs 32 young men and women, along with another 15 home-based affiliate production units that employ dozens more. Furthermore, the company has 15 full time office staff managing operations and sales. The only factor stopping production was the annual monsoon—but Arindam’s team devised a simple solution by using cut-leaf scrap to fuel dryers that now can prepare raw material no matter the weather. Arindam, along with his wife Dabblena (herself a master’s level social-worker) are building an eco-friendly business in the depressed, remote rural area of Barpeta—population 41,000 in a country with 1.26 billion souls. Tamul Plates provides women, men, and youth who previously had only agricultural and rock-splitting options paying just a few rupees, with a steady salary per piece collected or manufactured, all year. And Arindam is not alone: Featured in Entrepreneur India, he’s one of a growing group of young Indian entrepreneurs finding ingenious ways to employ indigenous materials and create jobs—out of throw-away materials that otherwise would go to waste. 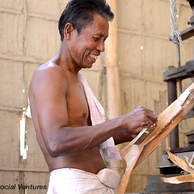 Tamul Plates factory worker using palm-leaf pressing machinery. Elrhino (“El rhino,” as in “the rhinoceros”): Just 67 miles away in Guwahati, a father-and-daughter team tinkered with their kitchen blender to concoct a unique recipe of elephant and rhino dung, recycled paper, cotton fabric scraps, plant fiber from banana trees, pineapple leaves, and water-hyacinth stalks, and cooked them into a 100% hygienic paper pulp. They named their company Elrhino to convey their mission to preserve India’s elephant and rhinoceros populations. The project began when a bored engineer, 72-year-old Mahesh Bora, was forced into retirement from his government job and sought to launch a company with an environmental and social mission—but ElRhino floundered until his daughter, 38-year-old Nisha, brought skills refined through her MBA and work in Mumbai as a marketing strategist to the factory office. Two years later, ElRhino turns a profit, having established a market for upscale products sourced from recycled materials that include sterilized dung fiber. (Elephants and rhinos happen to be vegetarians who chomp a lot more than they can digest—so their dung, once dried and cleaned, looks like wood mulch.) Having hired 15 factory workers who had been working small scale farms or as casual laborers, they now handcraft a line of stationery and household products now sold in India and as far away as France. Turning from large industry to appeal to small-scale farmers and businesses, they call for “The green technologies which increasingly use renewable resources; reduce wastes, pollutants, emissions; recover, reuse and recycle; reduce the pressure on natural resources and restore the balance of the eco-system and biosphere and ultimately help in providing ecologically sustainable development.” Perhaps it’s small businesses such as Tamul and Elrhino that can lead the way, one dried palm leaf, one sterilized rhino turd, at a time. All photography provided by Upaya Social Ventures.